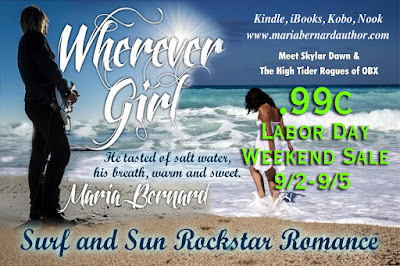 99c Labor Day Sale On Now! • Where would you go if you had nothing left to keep you around? Having nothing left to keep her around but memories, she flies away on a jet plane to the first place that calls her name, Outer Banks, North Carolina. When she arrives, she discovers that she is the first and the only guest at Skylar's Bed & Breakfast, an establishment run by a local skirt-chasing surfer with a heart of gold. At first, she's apprehensive, but Sara doesn't stand a chance against the captivating singer-songwriter's southern charm. When she meets his gorgeous friends and fellow bandmates of the High Tider Rogues, she can't help but wonder if she has died and gone to Heaven. • The descriptions of the beaches, ocean, and the wild horses are so eloquently written you will swear you catch a whiff of the salty ocean breeze. • A different story premise. All the drama at your fingertips!